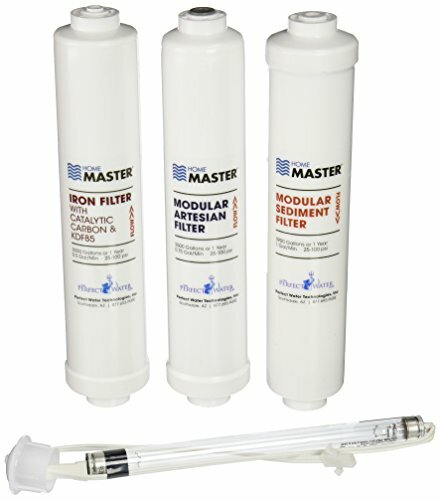 Home Master Hydro Perfection Filter Change Set. Meets NSF standard 42 for chlorine reduction and Class V particulate reduction; filters can remove up to 98% of chemicals including VOCs, TOCs, chloramines, chlorine, heavy metals, iron and others that create foul tastes and odors. Filter set lifecycle: 2,500 gallon or 1 year, or as needed. In the box: (1) 5-micron inline sediment filter, 1/4" push-in fittings, (1) 5-micron inline IRON KDF85 and catalytic carbon filter, 1/4" push-in fittings, (1) 5-micron inline Artesian and coconut shell granular activated carbon (GAC) remineralizing filter, 3/8" push-in fittings, and (1) replacement UV bulb for UV Filter 3 Instructions.